Johns Hopkins University Press, 9781421427102, 288pp. There seems to be widespread agreement that--when it comes to the writing skills of college students--we are in the midst of a crisis. 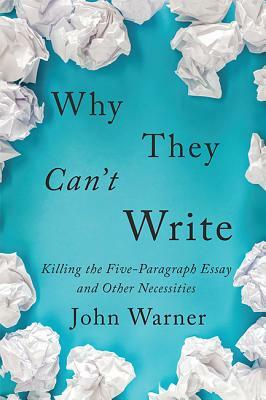 In Why They Can't Write, John Warner, who taught writing at the college level for two decades, argues that the problem isn't caused by a lack of rigor, or smartphones, or some generational character defect. Instead, he asserts, we're teaching writing wrong. Warner blames this on decades of educational reform rooted in standardization, assessments, and accountability. We have done no more, Warner argues, than conditioned students to perform "writing-related simulations," which pass temporary muster but do little to help students develop their writing abilities. This style of teaching has made students passive and disengaged. Worse yet, it hasn't prepared them for writing in the college classroom. Rather than making choices and thinking critically, as writers must, undergraduates simply follow the rules--such as the five-paragraph essay--designed to help them pass these high-stakes assessments. John Warner is a columnist for the Chicago Tribune, a contributing blogger for Inside Higher Education, and an editor at large for McSweeney's Internet Tendency. He is the author or coeditor of seven books.